���Of���cials listened to what we needed to locate here. They worked together to put a package together that made the deal come to life.��� our neighboring companies, but in the end, it was the state that coordinated the effort to get us the access road we needed. The road helps more than just us, because now the property adjacent to ours can be developed because it has access. It still feels like we are relocating to North Carolina with the help we continue to get. Patton: Our facility is in the stateowned Global TransPark, so we did business with many of the state agencies: Department of Commerce, Department of Transportation, Department of Administration and Department of Insurance. The cooperation between them amazed me, and a lot of that goes back to the Department of Commerce, which got us in contact with the right people. Trickett: When we ���rst looked for a site, the team that came to the table included representatives from the state, the county and the town. They listened to what we needed to locate in North Carolina. They worked together to put a package together that made the deal come to life. I could call any one of them and always get the same answer. Tref���nger: It���s important to recognize the relationship building that goes on throughout the state, county and local levels. At no time do you feel like you���re being sold something. It���s to the point that I can pick up the phone and dial up just about anyone, and the call will be answered. That���s different than what I���ve seen in other states. 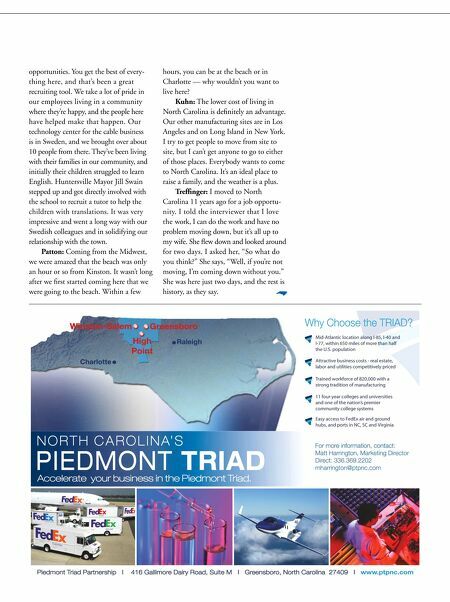 It���s just as our Linamar group president says: ���Service after the sale.��� How much is quality of life a factor in recruiting businesses to North Carolina? Trickett: Where we are located in Huntersville, it���s just 20 minutes to a metropolitan city, 20 minutes to an international airport and 20 minutes to Lake Norman and its recreational NC Community Colleges www.nccommunitycolleges.edu Andrew Kudlak Central Carolina Community College A.A.S., Mechanical Engineering Technology, 2011 NC Community Colleges lead the way in educating and training the workforce needed in today���s globally competitive economy.